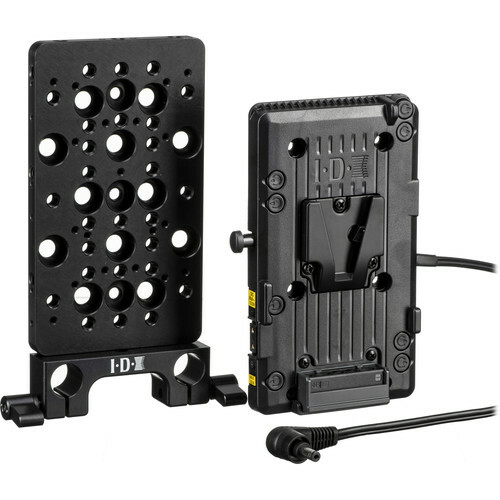 The IDX EOS-CP(A) Power Adapter Kit consists of an A-E2EOSC V-Mount Adapter and an A-CP(A) Cheese Plate and Clamp. This unit efficiently powers the Canon C100, C300, or C500 Cameras on a 15mm mini-rod system. The A-E2EOSC V-Mount Adapter allows direct mounting of IDX ENDURA batteries, and is designed for directly attachment to the IDX A-CP(A) or any other suitable mounting plate on an industry-standard rod system. The aluminum A-CP(A) Cheese Plate and Clamp enables the attachment of IDX V-Mount P-V2 series plates to the rod system in a variety of mounting positions. The IDX V-Mount Adapter Plate for Canon C100, C300, C500 enables any IDX ENDURA battery to power Canon C-series cameras. An integrated 20" DC cable plugs into the camera to power it. Two unregulated D-Tap outputs, each capable of taking a 50W load, are available for powering accessories. A suitable mounting plate, such as the IDX A-CP(A) cheese plate, is required for mounting this adapter plate onto a rig. Four M3 x 8mm screws are included for attaching to a mounting plate. The IDX A-CP(A) Universal Cheese Plate and 15mm Clamp Adapter is a battery plate adapter featuring numerous accessory threads. It's designed for a perfect fit with IDX P-V2 V-Mount plates but is also compatible with several other IDX camera plates (please see the bullet list below). The 15mm clamp adapter can be attached in 6 different positions around the cheese plate. If you attach it along the wide side of the cheese plate, positioning the cheese plate sideways, you can mount two P-V2 plates to the cheese plate by screwing in only a half portion of each. Box Dimensions (LxWxH) 5.9 x 3.7 x 1.3"
Box Dimensions (LxWxH) 7.9 x 6.75 x 0.9"